Congratulations! You’ve written a book. What comes next can be confusing, overwhelming, and daunting. But it doesn’t have to be. Asking how one “goes about publishing an independent book” is rather like asking “how does one build a house?” There is a universe of variables and solutions. Here at Indies Unlimited, we’ve tried to simplify this process so that beginning authors can see a direct path to follow. Please keep in mind, there is much more to it than this, including story fact-checking, pre-publication social media platform building, advanced reviewer coordination, post publication marketing, book promotion, etc. What you see below is the barebone book-producing process. We hope the following checklist with corresponding articles provides some guidance for you. This page will be in a state of continuous evolution and growth as we add more information. We will also be making a free companion book available. Please note that some of the articles carry SNARK alerts. This means only that those articles are written in a light-hearted satirical way. In these articles, you will still find useful information, but also a little humor. We think you’ll find this a welcome change from heavy and serious scholarly approaches. #1 – Proofread your book. #2 – Set your book aside for a few months. Then proofread it again. #3 – Get some beta readers. Have them read your project. #4 – Take Beta input; make changes as you feel are advisable. #5 – Find/Hire an editor. Oh Editor Is It Getting Drafty in Here? #6 – Take editor’s input; make changes as you feel are advisable. #7 – Find ARC (Advanced Review Copy) Readers. #8 – Take ARC Reader input; make changes as you feel are advisable. #9 – Prepare your “front matter” for the book. #10 – Write your book’s description which will be needed for the back cover & sales sites. #11 – Write your biography if you want to include it in the back of the book. #12 – Hire a cover designer/make cover art yourself. #13 – Hire ebook & print book formatter/format book interiors yourself. #14 – Upload book files to platforms of choice. #15 – Review sample/proof files to make sure formatting is correct. #16 – Hit the publish button. Congratulations, you are now an Indie Author! Ready for the next steps? 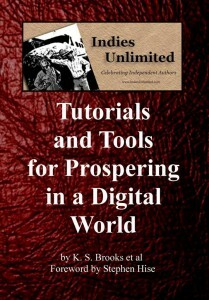 You can spend as long as you’d like here on IU searching articles for free, or you can download our Tutorials & Tools for Prospering in Digital World books through Smashwords. You can also find Volume I and Volume II on Amazon.com.